The California Boys and Arcadia Girls took a huge step up in class at the national Woodbridge Cross County Classic at the Great Park in Irvine. The course was a bit slower than previous years (and about equal to Rosemead), but the SGV performances were strong. 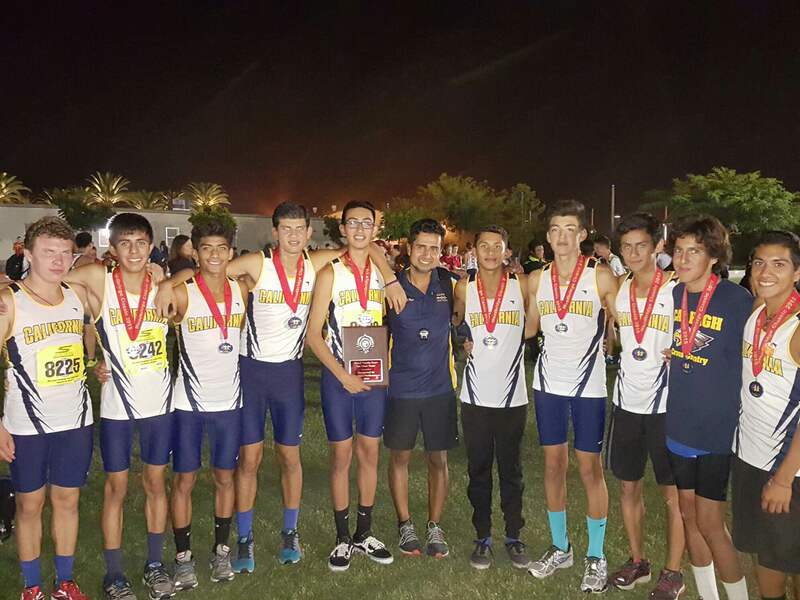 The Cal boys were the SGV’s top performers, winners of the Rated Race, finishing sixth overall. The Condors put their top three in the first fifteen of the race – Cisco Cuellar – 8th/15:02.3, Julian Romero – 12th/15:12.1, & Angel Aguirre – 14th/15:14. The SGV’s top individuals, running in the Sweeps race, also led their teams to excellent finishes. Jack Van Scoter (Sr, Flintridge Prep) was SGV #1 in 14:38.9 while finishing 6th – his team was 10th. Just behind was Salvador Capetillo (Sr, Baldwin Park) – 8th/14:39.8, running alone. But earlier, his BP teammates had dominated the Boys Blue Division race without him. Bishop Amat’s Robbie Santoyo (Sr) ran 14:52.9 for 19th and his team was 9th in the Sweeps. The Arcadia Girls, featuring four juniors and three sophs ran a strong 88:11.9 to finish fourth in the Sweeps race. Soph Holly Lung led her team with an outstanding 9th place, 16:58.8 finish, tops in the SGV The Apaches were nearly four minutes better than our next best team, and took six of the SGV’s top 14 spots in the meet. Complete Results of the Saturday Portion of the 2015 Woodbridge Cross Country Classic are here. Rankings of the top San Gabriel Valley Performers and all of the teams after the jump. I know this is somewhat arbitrary, but we’ve used the Glendale/La Canada border for what we consider the boundary for that part of the SGV. We will also include schools in our coverage that are just outside the area if they are in predominantly SGV leagues, like Ayala, if they identify with the SGV by competing in the San Gabriel Valley Track and Field Championships. So far, Crescenta Valley has not accepted our invitations to compete in the SGV’s.